i've just set live the first version of the Forza 7 Kudosprime Database. Cars List : List, filter and sort Forza 7 cars by stats and specs. Image for every cars, Forza Edition perks infos, and an interactive marker to track the cars you already drove - because you want to try them all, right? - or as the car you own in the game. We still can add our own in-game photos to each car. - Graphic overviews of Forza 7 Cars: select a preset criteria (ex: speed over PI) and see all cars in one simple graphic. 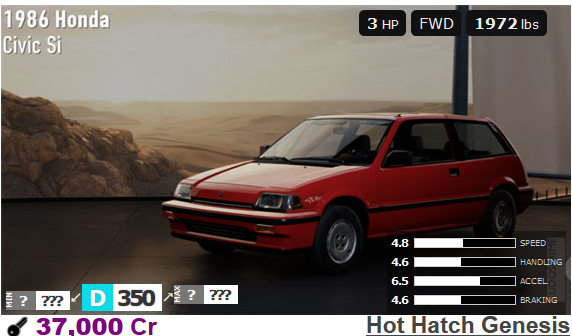 Hover the graphic to see car names or click a dot to see the car page. - Historic graphic of Forza 7 players against Forza 6 players. List of cars that can be won, and how to won them. This is a first version with (570 cars) Edit: now 724, as the new game structure doesn't help me to get access to much data right know. I currently don't know what strategy to take after this step - i spent almost all my last two days in menus so far, and barely played the game itself. I'll be back, but you can still give feedback. ps: K' is designed and coded specifically for the few games it covers. It requires dedication and time. If you want to support this effort, you can share K' address (https://www.kudosprime.com). I think PI's you have listed are the game's default homologation setups. Yes, they are indeed, as stated in the message on top of the car list (there's a lot of text above, so i can understand one can miss it). It's the state of the cars in which most players will likely get and drive the car in. Thank you for all you do milouse. Kudos prime is always super helpful. One recommendation, you should be able to see all available cars by going to the the rental screen , including cars locked from showcases and random horizon addition. If possible I would also recommend listing whether or not cars can be purchased versus only gotten from showcases or only from the speciality dealer. Although I understand that must be pretty difficult to keep track of this early in the game. If there's anything I can do to help data collection let me know. you should be able to see all available cars by going to the the rental screen , including cars locked from showcases and random horizon addition. If possible I would also recommend listing whether or not cars can be purchased versus only gotten from showcases or only from the speciality dealer. Although I understand that must be pretty difficult to keep track of this early in the game. Thank you, i've been so focus to make the Forza 7 section in a so short period of time that i must have been blind when checking the rental menu. You just saved me a lot of headaches. I plan to find a solution to present cars not available for purchase in a more informative way, but still debating with myself to get an elegant solution since the car entries in the cars list is overcrowd already. If there's anything I can do to help data collection let me know. You can also access the locked (hidden) cars by going through the paint menu. Click on the car icon, far right, then select "all cars" from the menu. It will show all the cars in the game, at this time., including the hidden. "Y" will toggle the stats of each car. Thanks for all your hard work, I use K's frequently when building a series. I'm not that surprised, some of "14" characters in values have been deleted, and i missed the HP check. Two other cars needed a fix. 1. The car database rose to 724 cars. Shouldn't be 727? :D I'll investigate this. 2. Tier filter in main cars list: through filter menu, or by clicking on the colored number (Tier) on the left of each car to list its tier-sibblings. 3. Forza Edition: a patch appears on FE cars in the main cars list. 4. Next to each car price, i added a Collector Score, 100 being the highest (right now). The higher the score is, the better you get collector value per Credit spent when buying a car. This lists all car prizes, with their "how to obtain". 2. The main car list now help to distinguish between car sources : buying, prize, Loot, Special dealership. It will not let me save what cars are in my garage. The key does not work. Are you sure you are account connected (please refresh the page once to be certain of it). If the problem still occurs, could you tell more about your device and browser? Account is connected. spiritdesire is the account. Problem occurs on dell inspiron 15, with opera browser. edit: also does not work on chrome. I'll pass on Opera, i don't support it for years. 1. In google Chrome, do Control+Shift+J when on K' carlist. This opens the Chrome developer console, where errors are shown. 3. If you got no red message at step 2, you can click on a car's key and see if a red message pop then. If still no error message, then i would put my two cents on an add-on related problem. Add-ons are off in Chrome private mode. I have two error messages. Running chrome and opera give the same messages too. Failed to load '' as a plugin, because the frame into which the plugin is loading is sandboxed. After some research, it seems to be google ads related. Do you see something on your system that could interfere with goggle ads? Great database. Thank you for all your hard work. You are no doubt aware that Turn 10 have recently amended the bonuses associated with Forza Edition Cars. Are you planning to do car stats without homologation parts? Not currently. Those data are harder to gather in the game. Is that important to have them since most cars are acquired/won with their homologation parts for free? I understand the data is hard to gather. I don't know about others, but I care about driving stock factory cars and about their stats, so these homologation parts ruin it for me to be fair and make the stats completely irrelevant. ...It's the state of the cars in which most players will likely get and drive the car in. I find the database with homologation setups perfect just the way it is although I do maintain my own excel spreadsheet which also records my cars owned, SHA (adds together the figures for Top Speed, Handling and Acceleration), HA (for circuits where top speed is less important ), details of championships, drivers cup and forza edition cars. My main table is filtered so that with a couple of mouse clicks I can find all the cars in a certain division or type etc, sort them into SHA or HA and know which should be best in a race. There's one macro in it which resets all the filters and sorts into my default order - Manufacturer, Year, Model. Hello, I don't remember this being an option in Forza pre-update, but now when you go to "Buy Car" menu, it shows stats for cars with no homologation parts, and it gives you an option to buy cars with stock or homologation parts fitted. Was this from the beginning? Could you now update the data for these cars in your database? That would just leave out the cars that can't be bought through that menu and have to be won through events or bought in specialty dealer, but it's the minority.